People’s Law School’ changes curriculum to focus on Harvey-related issues. 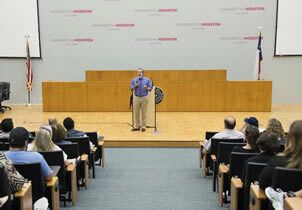 Professor Emeritus Richard M. Alderman welcomes participants to a special Hurricane Harvey session of the "People's Law School" which dealt with storm-related legal issues. Oct. 10, 2017 — The University of Houston Law Center recently hosted a special session of the "People's Law School" that was a bit more somber than usual, focusing on the many legal issues faced by victims of Hurricane Harvey. "This program is a little different from the ones we have done in the past," said Professor Emeritus Richard M. Alderman, who for years has led the program to inform people of their basic legal rights. "It is usually a fun and upbeat event. People are usually here because it provides information on something interesting for them to know. However, the main point of this program is a little more serious. "Harvey was a devastating event and most of the participants are here because of it. It not only destroyed property, it has disrupted your lives, and it is going to have long-term consequences. "One of the best ways to deal with all of this is knowing your legal rights. You do have legal rights and a lot of them you can deal with yourself," he assured participants gathered in Krost Hall before heading off to "classes" taught by volunteer judges, lawyers and law professors. In addition, a number of attorneys and FEMA representatives were on hand to meet individually with people needing specific assistance. Subjects covered a wide range of storm-related issues facing homeowners, tenants and businesses, including insurance coverage, FEMA qualifications, landlord/tenant disputes, contracts, price gouging and scams. Normally, the volunteer teachers field questions in various areas of the law, including business law, criminal law, credit and debt collection, wills and estates, health law, and landlord tenant law. Hosted by UHLC's Center for Consumer Law, which Alderman continues to serve as director, the free, biannual program is sponsored by the Houston Lawyer Referral Service. The "People's Law School" is the oldest and most successful program of its kind in the nation, having taught more than 55,000 people over the years.